You can rest assured if your pet is in hospital that he/she is receiving the highest standard of care in our specially designed Animal Hospital and Intensive Care Unit. Our hospital cages have been specially imported from Shor-line USA. These special animal cages are stainless steel which makes them safe and easy to keep clean and hygienic. Our dog ward has sound-proof doors to minimize noise in the hospital and so reduce the stress levels of your pets in the hospital. The on-site laboratory means you can get blood and urine results during consultation and do not have to wait for a follow up consultation. We have a dedicated surgical theatre suite which includes two fully equipped and staffed theatres and a prep-room for pre-operative examinations. We have a separate Isolation Unit and follow proper disinfection protocols. 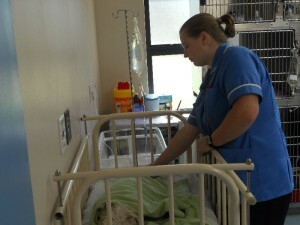 We have a separate Intensive Care Unit which is constantly monitored by the vets and nurses. Our separate cat ward offers a quieter, relaxed environment away from the dogs. We have access to MRI and CT scan as an adjunct diagnostic tool should your pet need them as well as on-site ultrasound, endoscopy and arthroscopy performed by qualified staff. Dr Gray is currently the only specialist veterinarian in the Western Cape performing Total Hip Replacements on dogs. Panorama Veterinary Clinic & Specialist Centre continually strives to provide the highest quality of service and health care for your pet and we will keep you informed as to any procedures and treatments your pet requires.